The Eco Easy charger is an overnight, 4 position charger, capable of charging 2 or 4 AA or AAA batteries and 2 x 9V PP3 batteries. 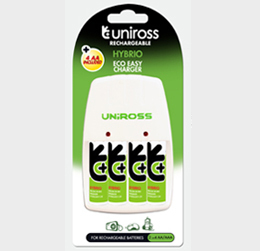 This charger is supplied with 4 x AA Hybrio Ready To Use batteries. Charging time is approximately 13 hours* and is supplied with 4 x AA 2100mAh Hybrio Ready To Use Batteries.